Coir substrate producer Cocogreen has received a prestigious Queen’s Award for Enterprise in recognition of six years outstanding growth in International Trade, proportional to all industries. Cocogreen has become a strong force in the UK berry market with its soft fruit substrates. The company’s advanced substrates have now gained a strong foothold in overseas blueberry, strawberry, raspberry and blackberry production as well as high value tree citrus, avocado, macadamia nuts and high value salad crops grown hydoponically. With headquarters in Manchester, Cocogreen serves clients via its own offices and operations in the UK, Sri Lanka, India, the Far East, Asia, USA, Spain, Portugal, Australia and Africa. 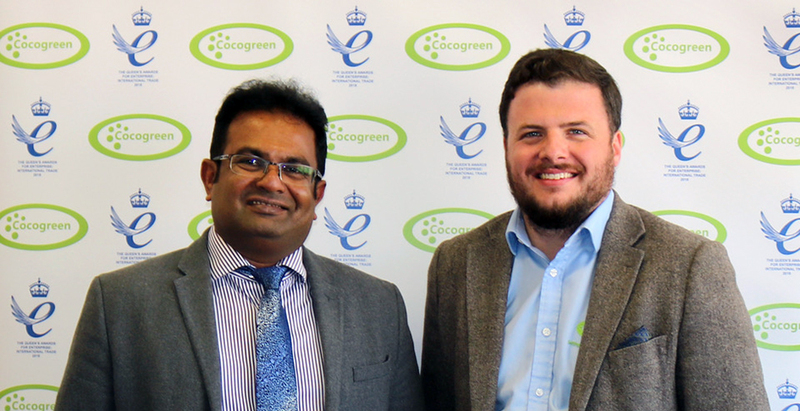 In June Cocogreen co-founders Dr Sudesh Fernando and Thomas Ogden will be attending a Royal reception at Buckingham Palace, hosted by Her Majesty The Queen.